Ever wondered how the Hank Edwards Reserve got its name? This piece was written by Bruce Kelly. 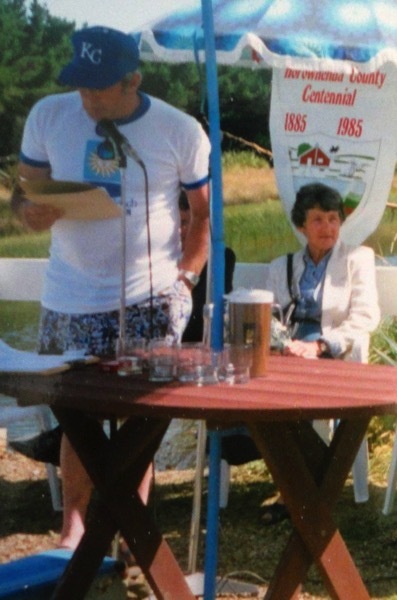 Hank Edwards, Secretary of Waikawa Beach Ratepayers Association virtually since its’ inception 20 years ago, died suddenly on 15th October 1993. His passing came as a tremendous shock to all who knew him. The names Hank Edwards and Waikawa Beach have been synonymous. At an Association AGM some years ago, when accepting nomination as Secretary for yet another year he said “I love this place”. The beach was his domain since his boyhood days and his enthusiasm for it was infectious, touching, if not involving us all in some way. Over the years he acquired an impressive knowledge of its history, unique environment, flora and fauna which gave him and the association a valuable background when considering various projects. Examples are the range of planting initiatives — trees, maram grass and spinafex to control sand drift into the river both north and south of, as well as across the face of the settlement. As well there were the plantings on the street berms. Control of the river itself was a major interest of Hank, as were the reserves, and access to the beach. He was the driving force behind getting the decision to build the new bridge. This is a shining example of Hank’s energy, commitment and negotiating skills. Safety at Waikawa was always uppermost in his mind — the need for suitably placed street lights and traffic safety; the need for care on the beach and in the water, and the need for requisite signs. The above is but a thumbnail outline of the results of continuous letters, telephone calls and approaches Hank made on the association’s behalf to official quarters and others over many years, often at his own expense. On a personal level Hank was the fulcrum of the associations AGM and its subsequent social hour. He led the organisation of the Boat Race and from time to time initiated other informal gatherings over the Christmas holiday period. An essential component of calling the troops to the AGM was attaching a p.a. system to his car and driving along the streets announcing in that well modulated voice “Annual meeting of WBRA is being held in Blue Skies garage at 4pm, bring something to drink, something to drink out of and something to sit on”. Over the years he donated many of the prizes for the children’s events at the Boat Race. These were instances of Hank’s keenness to bring the beach community together during the holiday period and of his meticulous yet unobtrusive organisation. Hank gave unsparingly of himself in the interests and welfare of others and expected nothing in return. Over the years his diplomacy and perseverance earned an enviable respect from then local authorities of the day. He also developed a very positive and continuing rapport with landholders in the vicinity of the beach settlement. The resultant works undertaken are in large measure due to Hank’s acumen. 1993 he was invited to join the District Council’s Operations and Services Committee in his own right. He was a valued member of the Courtenay Place Rotary Club. Hank’s funeral was held on Tuesday 19 October 1993. The spacious All Saints Church in Haitaitai was filled to overflowing. Themes reiterated during the service were his honesty, sincerity, sense of fellowship and goodwill to others. Thoroughness in all he undertook on behalf of others, and his lifelong friendships. The thoughts of everyone were with his mother Florence, who with her late husband first introduced Hank to Waikawa as a young lad all those years ago She has been a stalwart of the beach community ever since. On warm summery days Hank stripped to the waist in beach shorts and jandals, seemed to be oblivious to admonitions about the ozone layer. His tan was impressive. Often early on such afternoon his tanned figure, adorned with beach cap, unbuttoned flapping shirt and small haversack would be seen striding purposefully across the beach towards the sea prompting the comment “there goes Hank”. This was originally published in the March 2013 Newsletter. Hank Edwards opening the new footbridge in 1992. Life was returning to normal in 1946 and my father had at last his driving license and a motor car, a Vauxhall 14 complete with a bin box on the back. Our first holiday away in our own car was to begin to Otaki but after packing the car at Lyall Bay we had to call at “the office” where we found we had a flat tyre — a great start. Arriving at Otaki we found the “paying house guest” cottage a green two storied place and the owners were two spinsters. A pretty sparse top floor was comfortable but the bathroom and the owners turned out to be unbearable. We moved up town to the Telegraph Hotel and that proved the best move. Otaki town was a friendly place everybody knew everybody and guests at the hotel were a rare occurrence so we were welcomed into the group happily. Day trips were the order of each day. Buy our chops from the butcher and bread and it was off to explore the countryside. Down every side road, stop at a spot for lunch, explore and then off again. One side road led west, a long straight stretch of tar seal, a little wooden bridge, hard turn right on to a rough metal road, then a gate barring our way. Stop and explore. A small river on our right looked interesting. Returning to base we talked of our day excursion only to learn from the locals that the gate was not an entrance to private property but simply to keep the sheep inside as there were few fences on the property and if we went through — closing the gate behind us — we would eventually find a little settlement of a few houses and batches, campsites, a stream, a footbridge, lots of sand hills, a beach and not much else. And what was this place, why — WAIKAWA. We returned the next day clutching our chops, bread, thermette, for a real exploration. Through the gate, close the gate, down the rough road. On our right a big old homestead appeared surrounded by a picket fence, washing on the line. Enormous macracarpa trees on the left and on the right walnut trees and that stream again, its banks lined with pampus and willow. On down the road and on our left a cottage on a hill and in the distance a wool shed and a big high barn affair that turned out to be a thrashing mill. There were sheep everywhere. To the west we saw a group of three houses, two with tall towers topped with wind powered generators, their giant blades turning slowly in the breeze. There was a telephone line but no power lines. We arrived at the settlement, the first house was a modern affair of Durock sidings neatly kept but not occupied. Next door a permanent residence of some substance, well maintained and occupied and next door a little house of fibrolite again occupied and neatly kept. The road petered out to a one car track through giant lupin bushes. On we went, to our left a great green grass area with little a little bach nestled in the scrub, ahead the track continued to the right and there, two neat batches close by and further afield other shacks. We returned to the great grass area there to find a pipe in the ground dispensing a great volume of artesian water, cold, clear and sweet. We made our fire and cooked the chops, boiled the thermette and tea and went walkabout. We found the stream and the footbridge and giant sand hills upstream. Over the bridge and up the hills. At the top more giant hills and in the distance the sea. It was a long trying walk to the shore up and down. The beach was magnificent. We all three plunged into the surf on this hot calm clear day to cool off. The rest of the district remained unexplored by the Edwards family as they returned each day to Waikawa. For their next holiday they rented a bach, this became an annual event for the next 17 years. “Weekend, school holidays, annual holidays saw us ‘off to the Beach’. When father went away on business mother and I did not break the tradition. With 2 suitcases — one for clothes and one for food — we would board the train at Lyall Bay to catch the Field Express for the 2 hour trip to Manakau at a cost of 14/6 each return. To trip from Manakau to the beach was by taxi — a 1926 Essex driven by Mr Hornig, The back seats were plush and usually covered by hay — he was a dairy farmer. He would turn around and tell us of all the happenings since we last met — hair raising! Down the road, through the gate and a quick call on Grannie Drake achieved by simply driving off the road and across the paddock without removing his foot from the accelerator. Off again down the gravel road through the scrub and into the bach. My thanks to John Brown for the Hank Edwards bit. They cooked on the wood stove and lit the bach with kerosene lamps and candles until electricity arrived c1956. The toilet was an outhouse that “…provided great compost for Miss Leota’s leeks, peas and cabbages.” Water was obtained from a rainwater tank that houses a meat safe underneath. Hank would pitch his tent beside the bach at the end of the school year and live in it until he had to return to school. He kept occupied swimming, walking the beach, looking at birds and their nests, digging for toheroas and catching whitebait. With Ray Drake he hunted rabbit, pheasant and duck and fished from Ray’s boat. He remembered snapper tails flapping upright out of the water at low tide on a calm day as they buried their heads in the sand munching on Tua Tua. Also with a net dragging for flounder and netting snapper. From a boat, with hand lines and later a rod and later still 100 hook set lines bringing home snapper, gurnard, kahawai, shark and more. As late as the 1960’s 15–20lb snapper were regularly caught in the nets while dragging for flounder. On this property, the Edwards built the house they called ‘Blue Skies’. Hank did not write of the years of holidays in the house but he was still using it for weekends and holidays when he died in 1993. During these years he gained a broad knowledge of the wildlife, flora and fauna of the area as well as building up a collection of material on the history of the settlement which now resides with the WBRA. The reserve at the end of Waikawa Beach Road is named in his honour. May 2009: The Council plans to upgrade the Hank Edwards Reserve with plantings and more seating areas. To facilitate this a working bee will be held at the Reserve on Saturday 29 May. Please endeavour to give an hour of two of your time. A plan of the reserve showing the improvements will be posted on the notice board and on our website. 19 May 2009: As mentioned in the newsletter, Council plans to upgrade the Hank Edwards Reserve with additional plantings. Any one willing to help plant is asked to be at the Reserve starting at 9.30am Saturday 30 May. Council will provide spades and other tools, along with a barbecue lunch. 04 June 2009: Over Queen’s Birthday weekend the Levin Council supplied workers, mulch, tools, lunch and about 500 shrubs which were planted at the Hank Edwards Reserve. Levi Tate, a pupil of Palmerton North Boys and who lives in Levin, helped as part of his community service for a Duke of Edinburgh Award. Orange House owner Jim McKenzie also assisted. 15 September 2009: The council have supplied paint and tools for us to paint the toilet block in the reserve. If we complete the job they will donate us over $1000. Starting 9am Saturday 24 October 2009 at the reserve. We will have a BBQ on site. From: Working Bee — Labour Day Weekend. There is a Septic holding and dispersal field into the bushes close to the toilet. Rails protect the tank and vent pipe. There is also a bore for water supply. All are looked after by Horowhenua District Council. Note that there’s an AED Defibrillator on the street-facing wall of the Hank Edwards Reserve toilet block. In an emergency call 111 and you’ll be given instructions on how to open the box and use the defibrillator.